Posted on Tue, Apr 3, 2012 : 5:57 a.m.
Wendy Chapman and Johnny Vaughn, owners of Wendy clothing boutique in Ann Arbor’s Nickels Arcade, plan to debut another store this month. The 333-square-foot store, called Johnny, will be located in a neighboring space in the same covered shopping district on the edge of the University of Michigan's Diag in downtown Ann Arbor. The space was formerly occupied by the store Ionnia. The owners of Wendy in Nickels Arcade are opening a new store called Johnny across the hall. Johnny will take Wendy’s Comfy USA brand -- a female fashion line that Vaughn said sells exceptionally well at Wendy -- and move it across the hall. Vaughn described the California-based Comfy USA brand as having an “urban chic” feel with its crinkle tissue and linen fabrics. Popular products include tunics, cardigans and scarves. The new store will also carry accessories and it will cater to the same demographic as Wendy -- professional women -- but at just a slightly lower price point. Clothing at Wendy ranges from $50 to $600, and he said Johnny will likely range from $30 to $300. Vaughn said everything in the Johnny space will be painted white, including the walls, clothing racks and picture frames, so that the clothing stands out as artwork. He said the new store will open by April 23 to coincide with Wendy’s one-year anniversary. Vaughn, an artist with an extensive history in retail, and Chapman, a real estate appraiser, opened Wendy last year in the hopes of providing professional women in Ann Arbor with a place to shop for quality clothing. Since then, Vaughn said the store has become a “destination spot” in the city. Vaughn said he plans to hire additional part-time employees to work at the new store. They also plan to change Wendy’s hours to stay open until 7 p.m. instead of 6 p.m. Wed, Apr 4, 2012 : 1:58 a.m. They must be doing something right or they wouldn't be expanding. Its good to see a local shop thriving! Tue, Apr 3, 2012 : 7:15 p.m.
Good to hear local stores are doing good and they are expanding. Good Luck and best wishes. Tue, Apr 3, 2012 : 6:13 p.m. 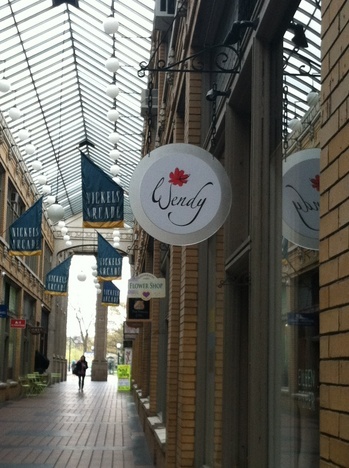 I love &quot;Wendy&quot; (the store) and am delighted that &quot;Johnny&quot; will also have womens clothing (from the masculine name I thought it would be a mens store). I have some *beautiful* pieces from Wendy that I treasure, and look forward to visiting both stores soon. Tue, Apr 3, 2012 : 2:24 p.m.
You get what you pay for. The question is what value do you get for your dollar. Like at Wendy, my guess is that you'll get a lot more for your dollar at Johnny then at Wal Mart and it won't be made in China. Tue, Apr 3, 2012 : 7:55 p.m.
At least as I am reading here? I can pan for gold but forget Johnny. He is too expensive for my budget. Besides, China is every where and cheap too. Give me cheap any day of the week. And yes, I do get what I pay for. My quality stretches are still hanging in there. Stretch pants woven with gold. Now there's value! Tue, Apr 3, 2012 : 2:01 p.m.
Who on earth is going to pay $600 for a pair of stretch pants? Give me Wal Mart any day of the week for comfy clothes. There is a lot I can do with $600. Ouch.